Discussion in 'Effects, Pedals, Strings & Things' started by Hack Prophet, Apr 28, 2016. A lot of love going around for Thorpy at the moment, thought I'd give it a looksy. I'm really into high gain right now and already have a Muff I like, so I decided to order up a Warthog. I was surprised to find that it sounds a bit more like an OD than a distortion to my ears. At first I thought 'meh' but then I started stacking pedals into it and wow. I won't bother with hyperbole and flowery prose in describing its sound but lets just say it's going on the board as the last in my chain of dirt pedals. It is loosely reminiscent of a Skreddy Screwdriver but it does its own unique thing. I particularly like the way it stacks with the FZ-2. Brutal. Anybody else digging the Warthog? uncle psychosis and urQuill like this. I've got all four Thorpy's, and it's my favorite of his. It has a very wide gain range and a lovely sound. Zeon45 and Hack Prophet like this. Really like the Warthog. It exceeded my expectations day one. Easily the most versatile dirt pedal I have ever owned. Superb build quality and very attractive pedal to boot. I'd rate it and the Turbo Tuner as the two best investments I have made in pedals. How does the amount of gain stack up to the gunshot/peacekeeper? I was surprised by how subtle the gain is when set to minimum, and it made me wonder what tones his other overdrives have that the warthog can't achieve. None of his pedals are super high-gain. The Gunshot maxes out at the same approximate gain level as the Warthog, but is darker. The Gunshot sounds best running at stage volume, in my opinion. It is also suited for bass guitar. The Peacekeeper has far less gain than the Warthog or Gunshot. It, however, can also do sparkling cleans, and has a much more powerful EQ section than the Warthog or (especially) the Gunshot. The Warthog and Gunshot are two sides of the same coin. OD/Distortions that really nail the cooking amp thing. Think American/British amps, respectively. 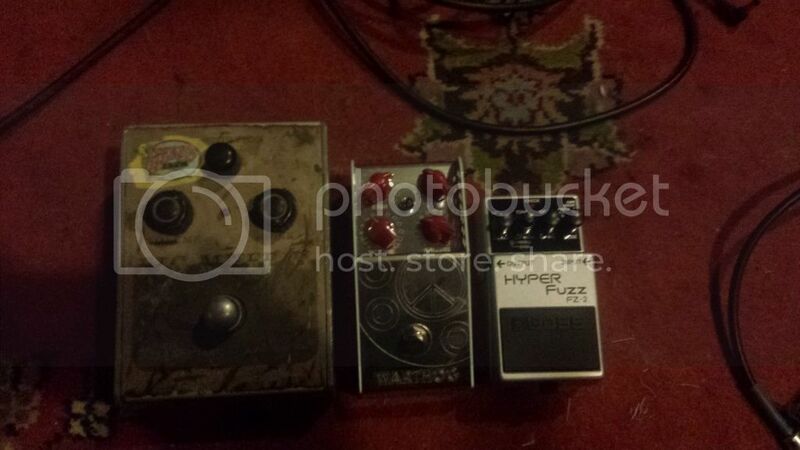 The Peacekeeper is going to be the new flavor of light OD around here, giving all the others (KOT, Klon/es, Tim, etc.) a run for their money in the hyperbole department. As I've stated elsewhere, it is of the absolute highest quality, but I find it to be the least inspiring of the Thorpy line-up. Anyhow, they're all great, but none have gobs of gain on tap. warren3333 and Caprica like this. The Warthog is fantastic, like the OP said not really a distortion (at least I don't think so) more of high quality medium gain overdrive. Only tried the Warthog from the Thorpy FX range had thought about getting a Peacekeeper but not that inspired with the sound clips. The Warthog I think is probably the best overdrive I've used or at least in my top few - also liked my original Klon but tonaly completely different & the Warthog is way more versatile. I love the Warthog for that gritty overdrive sound that I use for rhythm & crank up the gain is ace for leads too! Just looking for a low gain overdrive to compliment the Warthog to stack with - thinking maybe the tubescreamer route or a Klon type pedal like the Wampler Tumnus. I have a Bogner Red and from the Warthog youtube videos it seems like they both have this scooped and compressed character. Has anyone tried both? I have not tried the Warthog, but I own a Gunshot and this is as you describe: scooped and compressed (in a good way). Apologies for reviving this thread - I'm curious as to how much gain this pedal has... It was said in this thread that this pedal isn't really a distortion and has the same amount of gain as the gunshot. I've been looking at youtube clips and it seems very gainy... almost enough for metal! Can anyone compare it to a distortion box like a Bearfoot/BJF Dyna Red or similar? I have a Warthog, I don't think any of the demos really do it justice. It has plenty of gain, but when it's set for high gain, depending on how all the knobs are set, it can sound a bit like a fuzz pedal- which isn't a bad thing. Thanks - can the pedal be set for high gain with and without "fuzz" using the calibre knob? How much gain does it have? Compared to say tubescreamer, OCD etc the standard drive pedals? It has more gain than a tube screamer, it can get get fairly heavy. I'm not exactly sure how much fuzz can be dialed out with the caliber knob, hopefully I can test that out, later today. I would call it fuzz-like, as opposed to fuzz. I would think you could get some acceptable 70's metal sounds, especially if stacked with a boost of some sort. To be honest, I don't use mine very much, but i do think it's a great sounding pedal. It definitely has an American flavor to it, and is a polished, pristine type of sound. I bought my Warthog, quite recently, and had never really put it through the paces- until today. It sounds really good, and there is plenty of gain on tap. With the caliber knob turned down, it sounds less fuzzy than with it turned up, and is a tamer sound. The caliber knob turned off, doesn't really allow the pedal to reach it's optimum sound. So, it has the slightest hint of fuzz-like character to it, when you set it to sound it's best. I like that sound, and it doesn't sound like a straight up fuzz pedal. I a/b'd it next to a Faceless MKlll tonebender, and although there was a slight similarity, the Warthog sounded like a distortion/overdrive pedal. It does have sort of a glassy tone, compared to most other distortion pedals, but I don't mind that. It's not tight enough to play modern metal riffs. It's spongier. It does have lots of gain and can sound massive, though. I've owned a few Bearfoot pedals through the years, but never the Dyna Red, so I can't compare it. I have the Muffroom Cloud also. It sounds great! Massive amounts of bass available. When maxing out the gain on both pedals, I think the Warthog has more presence. The other thing I never read anywhere about these pedals is that they stack beautifully. The EP Booster sounds great with either. A Simble work great as well. keep coming back to this pedal, it just does its own thing, can't really describe it but it keeps growing on me despite the fact I already love it. Lately been cranking both gains and achieving a pretty cool Crazy Horse era Neil Young tone. Between the two gain knobs,the rather versatile tone control, and my guitar's volume knob there is still a lot of tone to explore after owning this thing for a year and a half.